Yamana Gold sells its Chapada gold-copper mine to Lundin Mining for $800 million plus contingent considerations worth over $225 million. The transaction will help to improve Yamana's balance sheet significantly. After failing to acquire Nevsun Resources and its world-class Timok copper-gold project, Lundin Mining finally utilizes its huge cash pile. The market reaction indicates that Lundin Mining is the winner. 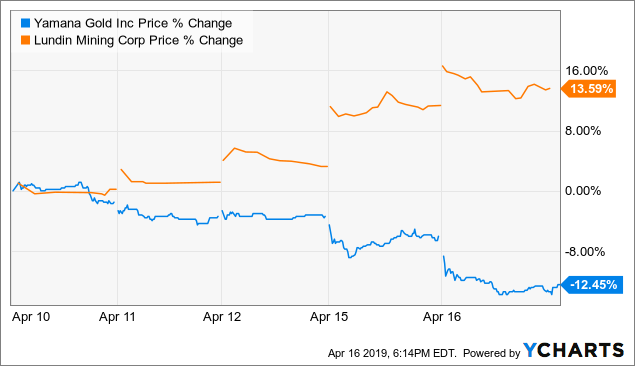 On April 15, Yamana Gold (AUY) and Lundin Mining (OTCPK:LUNMF) announced a deal that helps Yamana to improve its balance sheet significantly, while it enables Lundin Mining to utilize its huge cash pile. Lundin Mining will acquire Yamana's Brazilian copper-gold mine named Chapada. Yamana will receive cash consideration of $800 million and further contingent considerations of up to $225 million ($125 million related to the price of gold and $100 million related to the potential pyrite roaster construction). Moreover, Yamana will retain a 2.0% NSR royalty on any future gold production from the nearby Suruca gold deposit. The Chapada copper-gold mine is situated in central Brazil. Taking into account also the Suruca zone, it contains reserves of 4.546 million toz gold and 3.706 billion lb copper. Besides the reserves, there are measured, indicated and inferred resources of further 3.946 million toz gold and 2.566 billion lb copper. Chapada's current production capacity is approximately 120 million lb copper and 100,000 toz gold per year. It means that Chapada is technically a copper mine with sizeable gold by-product, as at the current metals prices, more than 70% of revenues is attributable to copper. It is expected that the current production rate should be sustainable at least by 2034. However, the sizeable resources offer several future development scenarios. Right now, the capacity of the concentrator is approximately 23.4 Mtpa. However, Yamana was considering options to expand it to 28-32 Mtpa, or by 20-37%. If this expansion is realized, it will have a significant positive impact on the annual production volumes as well as on the production costs. On a co-product basis, the cash costs should equal approximately $1.7/lb copper and $430/toz gold. Although the AISC estimates haven't been released, on a by-product basis, they should be comparable to the co-product cash costs. According to miningdataonline.com, the AISC was $1.74/lb copper or $385/toz gold in 2017. As of the end of 2018, Lundin Mining held cash of $815.4 million and long-term debt of $7.2 million. According to the news release, it intends to use its cash on hand in a combination with the $550 million revolving credit facility to finance the acquisition. Even with the Chapada mine acquisition, the company should remain net debt free. However, after the transaction is completed, Lundin Mining's copper production should increase approximately by 26% and its copper reserves by 46%. Based on the 2018 results, Yamana Gold will lose almost 13% of its gold and 100% of its copper production. Moreover, its gold reserves will decline by 27% and copper reserves by 39% (attributing 56.25% of the integrated Alumbrera-Aguarica project to Yamana). On the other hand, its cash position will improve from $98.5 million, as of December 31, 2018, to approximately $900 million plus cash flows generated during Q1 and Q2 2019 (as the completion of the transaction is expected in early Q3). Yamana's net debt position will improve from $1.66 billion to less than $0.9 billion which means a significant improvement. But who is the winner of this deal? A simple calculation can indicate a lot. Let's say that by 2034, the Chapada mine will be able to produce 120 million lb copper and 100,000 toz gold per year as expected and that the AISC will be around $1.75/lb copper. At a gold price of $1,300/toz and a copper price of $3/lb, the NPV(8%) of discounted cash flow generated between 2020 and 2034 equals $1.284 billion. Even at an AISC of $2/lb copper, the NPV(8%) of the generated cash flow would be $1.027 billion, which is more than Lundin Mining will pay for the mine. It is important to note that this calculation doesn't take into account any cash flow generated in 2019, any cash flow generated after 2034, any mine expansions and any metals price growth over the next 15 years. This clearly shows that Lundin Mining is the winner here. It seems that the market has a similar opinion (chart above). While Yamana Gold's share price is down by more than 12% over the last 5 days, Lundin Mining is up by more than 16%. The Chapada copper-gold mine is a valuable long-life asset, located in a relatively safe jurisdiction. According to the expectations, it should be able to maintain the current level of annual production (120 million lb copper and 100,000 toz gold) at least by 2034. However, the reserves, as well as resources, are big enough to support a longer mine life or a mine expansion. Several options have been already considered by Yamana and it is possible to expect that also Lundin will be seeking some options to maximize the value generated by this asset. Yamana Gold will sell the Chapada mine to Lundin Mining for $800 million plus contingent considerations of up to $225 million. The money will help Yamana Gold to improve its balance sheet significantly. On the other hand, it will help Lundin Mining to increase its gold and copper production considerably. Both of the companies can find some positives on the transaction, however, the numbers show that Lundin Mining is the true winner here. At the current metals prices and some conservative assumptions, the NPV(8%) of cash flows generated by Chapada between 2020 and 2034 should be notably higher than the price paid for it.